I love fish. Sardines, sashimi, smoked haddock chowder, Portuguese bacalhau, Bengali fish curry … but most of all I love plaice. Baked or grilled with a smudge of butter, salt, abundant white pepper, parsley and a lemon wedge. Jazzed up with leeks or a light scattering of chopped olives and anchovies. That’s from A History of the Fishes of the British Islands by Jonathan Couch. 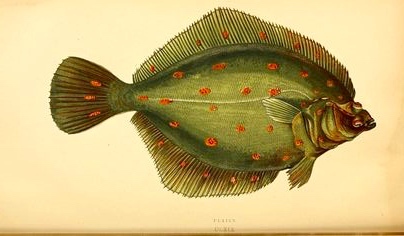 It was published in the 1860s, before warming sea temperatures drove plaice and other species further north. The European plaice (Pleuronectes platessa) is a Northern Hemisphere flatfish. You don’t find it in southern waters or for sale in Australia. So I try to eat my fill on visits to England. When my mother was alive I’d cook fresh fillets or whole fish and serve them with a reduced fat rémoulade (one-third mayonnaise, two-thirds yoghourt, capers and fine-diced pickled gherkin). More recent trips to England I’ve usually been staying in places with minimal kitchen facilities, so I’ve had to get my plaice-fix ready cooked. Before I discovered the rather wonderful North Sea Fish restaurant and take away during my last visit to London, this usually meant a fish and chip shop. Popular fish cooking in the UK has traditionally involved a lot of frying, battering and bread-crumbing. While batter works for end-of-the-pier fish and chips eaten out of newspaper, when it comes to plaice I prefer mine batter-free. Its flesh is soft and delicate, its taste subtle, almost milky. A light, barely-there tempura-type batter might be OK, but thick batter overwhelms the fish. I also like plaice served cold in a Danish style open sandwich with shavings of cucumber. Plaice is often eclipsed by its rich relatives, sole and turbot. For Jane Grigson ‘the sole is the darling of the sea. Of all the things we eat the greatest stimulus to chefly lyricism’. Plaice she regards as inferior in every respect. It belongs to a Britain of corner chippies, brass bands, Victorian brickwork and laundrettes. Last month in London I used a laundrette for the first time in years—because along with no means of cooking, the place I was staying had no laundry either. While the dryers tumbled pocket dramas played out. Over the fabric conditioner an Aussie backpacker chatted up an American exchange student. An ex-soldier explained how PTSD made it impossible for him to travel on the underground. Billingsgate has been London’s fish market since 1699. We went there on a school excursion. Rendezvoused in the pre-dawn dark, climbed aboard the coach and headed to the Italianate building that housed the market before it relocated to the Isle of Dogs in 1982. Inside the slang was Cockney, the light murky and everything smelt fishy. Miss pointed out crates of glistening plaice, cod from the Arctic and boxes of exotica from distant oceans. Yes, they look as if they’ve swum out of a painting by Picasso. One side is white, the other dark and freckled with spots the colour of orange cordial. This makes sense when you know that plaice spend most of their adult life lying sideways on the seabed. The fry resemble those of other fish with two eyes in the usual place, but as they grow, the left eye migrates to the other side of their head. And the plaice spends the rest of its life with both eyes staring up at the roof of the ocean, and no way at all of looking down. How did this asymmetry evolve? Even Darwin was baffled. In a North London charity shop I found a slim hardback The Plaice being the Buckland Lectures for 1949 by R S Wimpenny. It’s one of those old, odd publications you sometimes find on the dustier shelves of secondhand bookshops or under a pile of blankets at a garage sale. One-hundred and forty-five pages inside a green cover. A whole book about the plaice … Wow. Blastula and gastrula, operculum and optic vessels … It’s too technical, too scientific to be an easy read, but I do learn that concern about overfishing and conservation efforts go back to the reign of King Edward III in the fourteenth century. Cultures have built culinary mythologies and identities around the cooking and consumption of certain seafoods—Japanese sushi, the bouillabaisse of Marseille, kippers and wild salmon from Scotland. Not so for the plaice. Flat of face, plaice is considered an unremarkable, also-ran sort of fish. 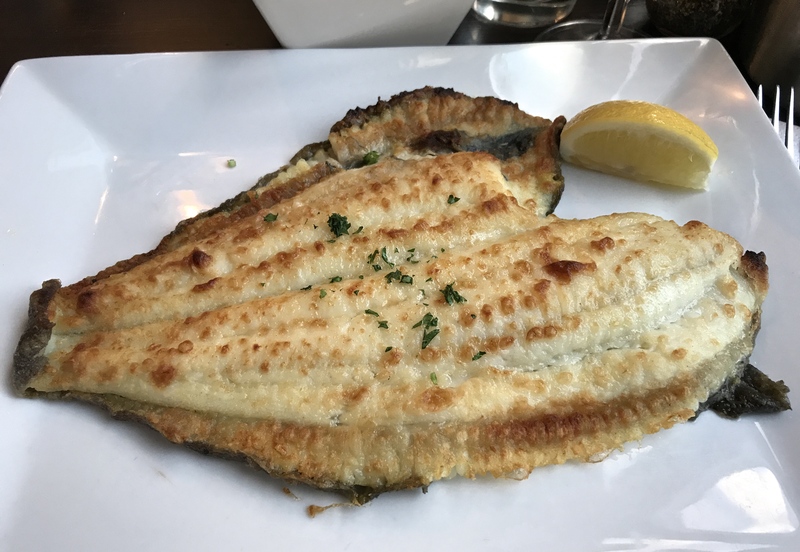 Unlike Mark Kurlansky’s cod (A Biography of the Fish that Changed the World, 1997) and Donald S Murray’s herring (How the Silver Darlings Shaped Human Taste and History, 2015) plaice didn’t change the world or shape human history. 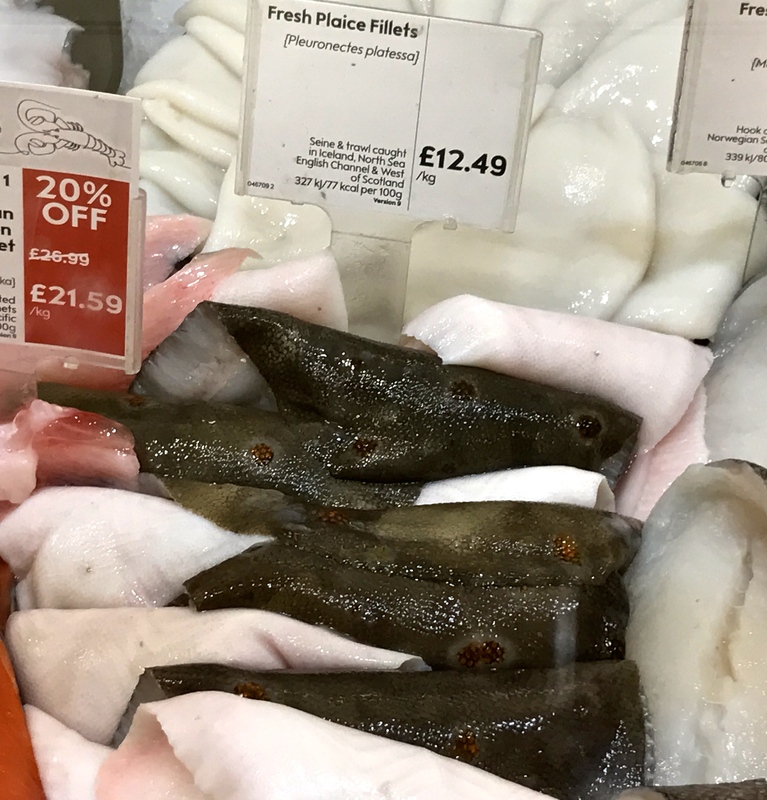 Overlooked and under-rated it may be, but plaice remains my number one fish. « Where do rum balls come from?